New graphic charter: » See the home page. Creation of Kazoku, an educational card game to learn Japanese characters. This year, the web site receives 723.129 visitors who viewed 2.694.971 pages. This year, the web site receives 266.260 visitors who viewed 1.346.336 pages. This year, the web site receives 196.713 visitors who viewed 1.026.800 pages. This year, the web site receives 215.274 visitors who viewed 1.323.868 pages. This year, the web site receives 116.918 visitors who viewed 594.136 pages. This year, the web site receives 155.007 visitors who viewed 918.803 pages. This year, the web site receives 153.203 visitors who viewed 955.739 pages. This year, the web site receives 131.516 visitors who viewed 1.055.172 pages. Light modification of the home page. It is now possible to search for a name from the home page. » See the home page. This year, the web site receives 137.168 visitors who viewed 1.431.254 pages. New DNS: furankofon.com. 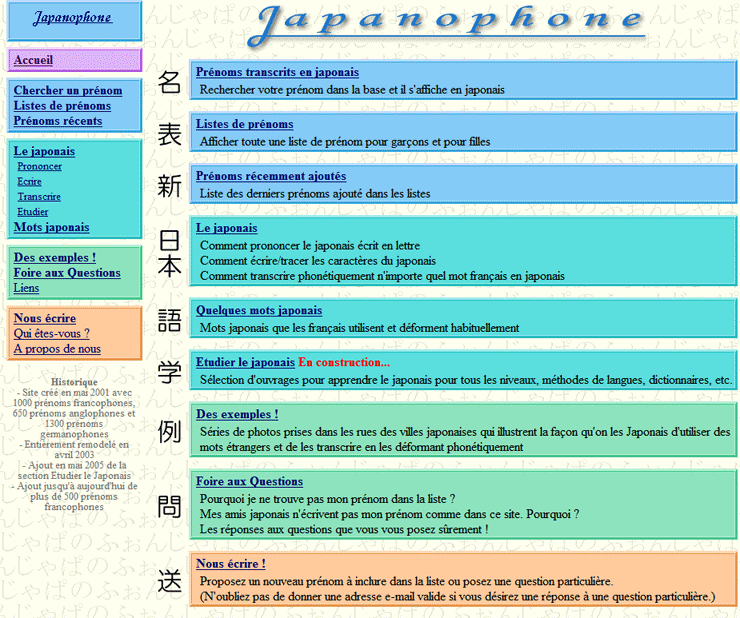 Le idea is to add to web site a section meant for Japanese people. The "Donate" section is removed because it is absolutely useless. This year, the web site receives 147.946 visitors who viewed 1.900.646 pages. 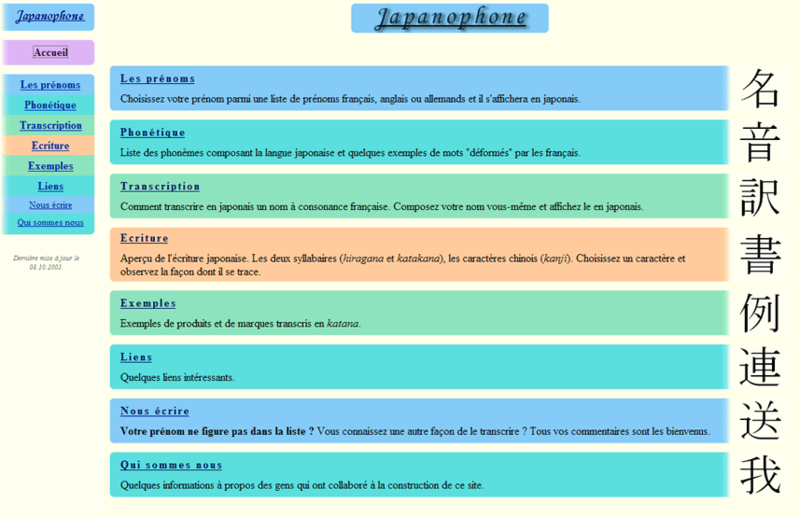 Achat des adresses : japanophone.net et japanophone.org avec redirection invisible vers japanophone.com. This year, the web site receives 145.115 visitors who viewed 1.744.180 pages. This year, the web site receives 188.627 visitors who viewed 1.376.268 pages. This year, the web site receives 110.765 visitors who viewed 110.765 pages. This year, the web site receives 61.431 visitors who viewed 582.683 pages. Graphics being too heavy for the modem connections at this time, the design of the web site is entirely revised so that it becomes much lighter. 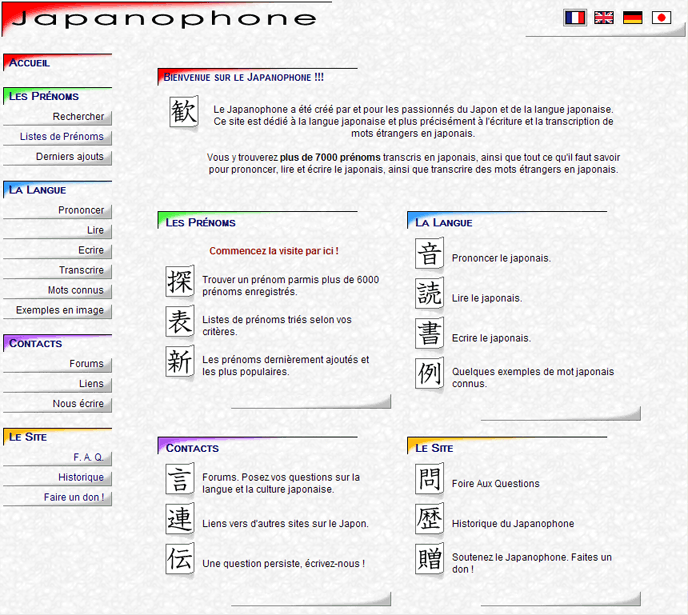 New DNS: japanophone.com. 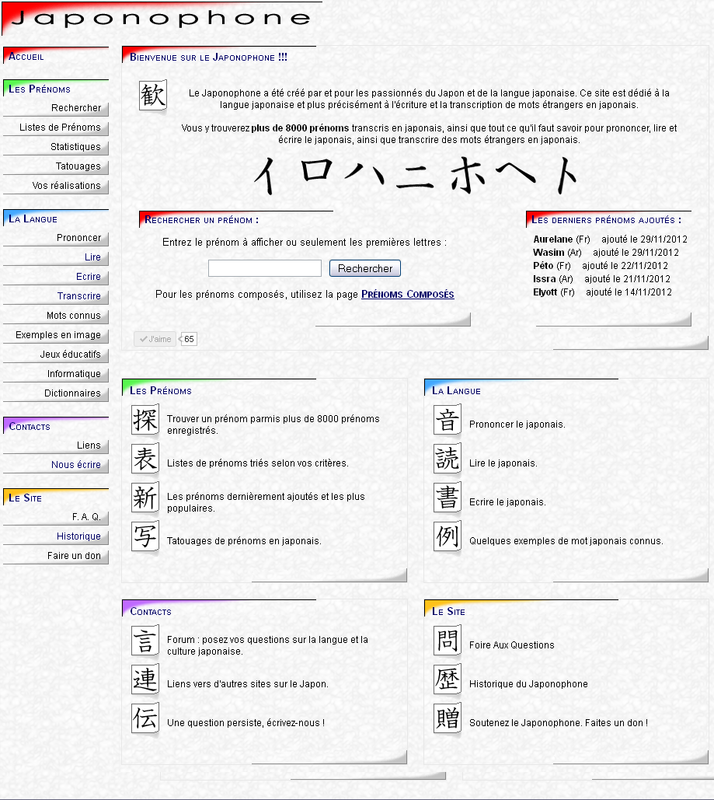 The web site is hosted by www.ovh.com. The web site recoded using php and MySql. This year, the web site receives 16.744 visitors who viewed 107.102 pages. The web site receives 140 requests to add a new first name. The web site receives 8 requests to add a new first name.